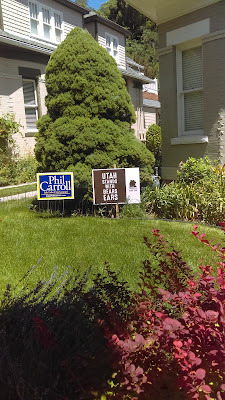 The sign on the right says "Utah Stands with Bears Ears"
For those who haven't followed the Bears Ears saga, one of the arguments in favor of making that area a National Monument is that the local Native American tribes consider it a sacred place and have asked for National Monument status to protect it. For me, that is the only argument we should need. The land was theirs to begin with. But American (and specifically, American West) politics being what they are, it was always going to be a controversy. What was interesting to me while traveling in the area was that the controversy doesn't necessarily sort cleanly on Republican-Democrat lines. 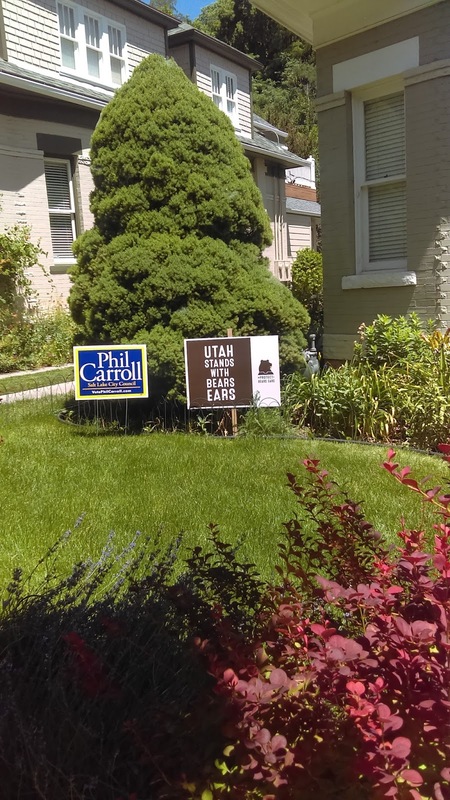 I saw those "Utah Stands with Bears Ears" signs in yards that also sported signs for an upcoming city council election, and the Bears Ears signs co-existed with signs from competing candidates. I also saw postcards the tribes had put out urging people to contact the Department of Interior in support of Bears Ears in many places, including some places I wouldn't have expected, like the little bar and grill we ate lunch at in Mexican Hat. I didn't ask anyone about the issue, though, because I didn't want to bring up politics on this trip. Honestly, I never do: that's not the type of traveler I am. But this year, in particular, I thought it best just to avoid politics. But what could we do when we came across this sign outside the Utah State Capitol? We saw some people taking photos, and thought they were getting a weird angle on the Capitol. But when we crossed the street, we saw that the Capitol wasn't the subject of the photo at all. We didn't get a photo of our favorite political sign, though. This one was on the small road we took out to see the southern tufa formations at Mono Lake. We passed an "adopt-a-highway" sign that announced this stretch of road was cleaned by "One of them June Lake liberals." That is a direct quote. 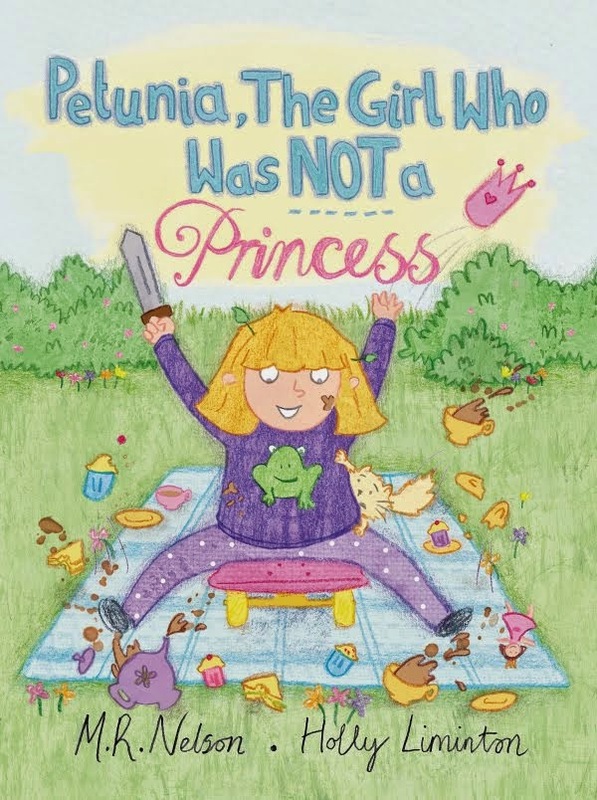 Although I was avoiding discussing politics, the vacation was over the 4th of July, and like many Americans who are worried about the Trump administration, I found this year's 4th a weird one. I thought a bit more than usual about patriotism, and what makes me proud (and not so proud) of my country. The times on the trip I felt proudest of my country were the visits to the national and state parks and historic sites. We have so many beautiful and special places, and I am proud that we are protecting them and working to make the accessible to everyone. Also, every park ranger we spoke to was great: helpful, friendly, and enthusiastic. Our kids did the Junior Ranger programs wherever they could, and collected quite a few new badges. Every ranger who talked to them as a part of those programs was great and encouraging. With the exception of the traffic jam in Yosemite, I was impressed with how the parks were run. A lot of care goes into making sure visitors of all types have a good experience. The time I felt the least proud of my country was actually on the 4th of July. This wasn't because of the general sadness I felt about the state of affairs. It was because as we walked back to our car after watching the parade and seeing some of the sights in Virginia City, we passed a house that was displaying a giant Confederate flag. I'd seen several trinkets with Confederate flags on one of the shops in town, too. Now, Nevada was never part of the Confederacy. In fact, its state slogan is "Battle Born" because it joined the Union during the Civil War. There is no "heritage" in flying the Confederate flag in Nevada, or in selling trinkets with that flag on them. There is just hate. I am ashamed that flag is being flown more and more often in places without even the tenuous claim to be treating it as part of their heritage. On the flip side of that experience, though: One of the groups marching in the Virginia City parade was a group representing the Sons of the Union Veterans of the Civil War, and they got one of the biggest cheers of the parade. The juxtaposition of those two things is probably a pretty accurate representation of the state of things right now. And that's enough about politics for now. Next week, I'll get into the stories about the wonderful places we visited.